As a busy horse owner, you really haven't got time to waste chopping carrots or waiting around to make up your feeds. Carrot Express is so easy and convenient to use when you’re busy with horses: Simply add water and then carry on with your usual stable routine, mucking out or grooming, and by the time you get back to it (after 20 minutes or so), Carrot Express will be ready to feed! When water is added to 1kg (one tub) of Carrot Express, it will become approx. 5kg of rehydrated carrot. • Take a handful (approx. 40g) of Carrot Express and add to a bucket with 1/2 litre water to cover and soak for a minimum of 20 minutes. 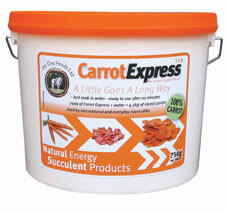 • Carrot Express can be soaked for longer, even overnight, if required. Once soaked, Carrot Express will keep for up to 24 hours in cool conditions. • Any remaining liquid left after soaking is also high in nutritional value and can be used to mix with feed or to tempt a horse that is reluctant to drink. Carrot Express is available all year round, and is packaged in convenient 1kg tubs that have a shelf life of up to one year. My Day Feeds Ltd, PO Box 358, Stevenage SG1 9AQ.